We are pleased to released Modern Tile Maker, a freeware for Windows 8 that will allow you to create Modern or Metro style Tiles for Files, Folders, Desktop Programs, Web links and more. When you create a shortcut of any folder or software on the start screen, it takes on the default form. But using Modern Tile Maker, the tile actually appears like a Metro UI tile – similar to how the Metro apps tiles look. There are some ready-to-use Transparent Tile Icons that have been included along with the download. These number over 100 and come in 2 styles. The size of the Tiles are 150×150. Larger images will be scaled down to fit. The process of generating the Tile images is efficient and pretty good at keeping the image quality without any loss. We recommend using Transparent Images as it gives a better option of selecting colors for the Tile. The option for Wide Tiles is currently unavailable. Includes 100 Transparent Tile Images formatted for use when displaying text or not displaying text (200 total images). 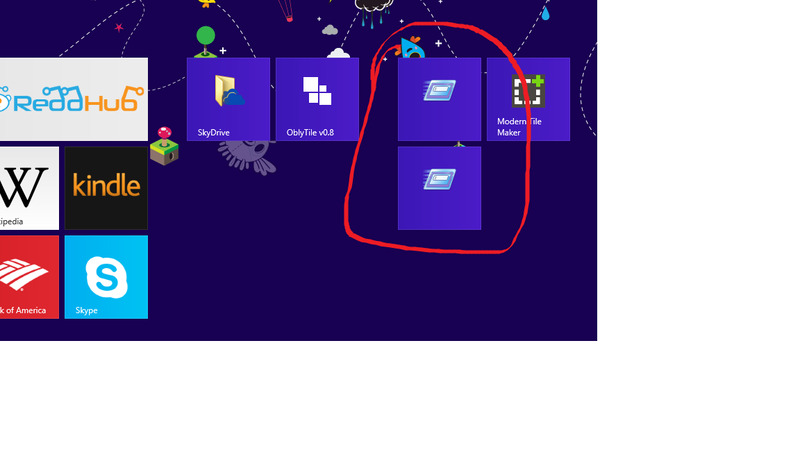 NOTE: If you make any changes to your computer or something just goes wrong and all of a sudden your Tile Icons display a standard Desktop icon instead of the Modern (Metro) Tile, load the application and click the Refresh Button. Give the Start Screen about 30-60 seconds to refresh itself and see if the tiles refresh themselves back to the Modern (Metro) Tile. If no changes still, Restart your computer and see if it reverts the changes back. If all this fails you will may have to unpin the tiles from the Start Screen, open the application and re-pin them using the backups that were created. Download Modern Tile Maker. Once you have installed it, create a system restore point and then go ahead and create Metro Tiles for even your legacy software, folders and files on Windows 8. If you wish to uninstall Modern Tile Maker, you can do so via the Control Panel. If you have any questions, our developer Lee Whittington will be happy to help you out at the forums. Duplicate of OblyTile. Be innovative TWC. If you read the ReadMe file which is included in the download, you will read the acknowledgement by the developer: “…Thanks to the program Oblytile and the shortcuts it created as well as shortcuts for webpages created by Modern (Metro) IE I realized you could use IE as a base for the tiles…”. I used Oblytile, but when I create tiles with this it gives me an error. Source: Microsoft VBScript Compilation error. Also can you add optional shortcut parameters just in case we want to add target lines tot he icon. Overall much simpler program than Oblytile, but if you help me with this error then that would be great :D.
Ok I realized if you have obytile, and you install this. I ended up getting that error, and I tried opening up obytile, and making another icon. It made all my icons disappear and have a default looking empty icon. I used the refresh a couple of times, and it’s not detecting it. I even restarted, and still won’t make my icons come back. I even tried making an new icon just from obytile, and still doesn’t work. What is going on here? Ever since that VB error script on your program it ruined everything. Now I can’t even use obytile or your program. I uninstalled and reinstalled your program, and not even the modern tile maker icon appears on the start screen. Nevermind I got it back. I set the internet explorer as the default program, and they reappeared. Weird. I havent used Oblytile, and my shortcuts made with this doesn’t work, i get same error. I haven’t used this yet, but from the screenshots it doesn’t appear to have a backup feature for moving to a new OS or reformatting. Is this possible? It would be a really nice application but fur me there is currently an annoying issue. If I create a new tile everything looks fine, there is a tile with the picture and the text. But if I press on the tile I get an error message that the vbs script has ended. This is because in the vbs there is a ” missing. At the and there is no “. If I add one it works but I haven’t got a tile image anymore. No matter if I create them via MTM or OlbyTile. I have tried the refresh button and restarting, nothing works. (any tile I create looks like this, tiles created normally via right-click + pin2start look normal; they still work, but the image is always this). Hi, I had the same issue and it worked only when I changed my default browser to IE. I have requested the developer Lee to have a look at the commenst here. Till he does so, I request you to restore back to the good system restore point you have created before trying out this tool. I have question. Is someone using it with default browser other than IE? When I change my default browser to other the tiles look like in Gary Oaks image. 2. set up your tile with image, color, name etc. Have the same issue. But Internet Explorer as default dont work for me. Seems MTM after Oblytile, at 11 line open destination with ” but don’t close at end of the line. Closing line manually fix the app run problem but icons still not shown. Me too, I Have the same issue and can’t fix it..Any solution? I love a program like this but when I checked it with virus total, symantec gave it a bad reputation. The same happened to the Oblytile. Are these programs really safe? Hope stardock will release their own version, I will buy it, because I trust that company. Hope this comment reaches Stardock. The program is safe. Thats a false positive. But you may form your opinion and take an appropriate decision. Would love it if the developer could make this compatible with Google Chrome.